Jesus Christ died for our sins in order to bridge the gap between us and God. The Bible tells us that “all have sinned and fall short of the glory of God.” (Romans 3:23) No matter how hard we try or how good of a person we are, we are all sinners. We can go to church every weekend, be kind to our neighbors and do our best to avoid the “really bad” sins, but we are still sinners. Jesus is the only sinless man to have ever lived. As a result of our sin, we are all permanently separated from God, and there is nothing we can do to change that on our own. Romans 6:23 says “for the wages of sin is death.” Because of the choices we have made, we are destined to spend eternity away from God. There is a permanent gap between you and God. By believing in Jesus Christ, you are welcoming God into your life so that you can begin a relationship with Him. Deciding to follow Jesus Christ is more than just trying to live a better life. It is acknowledging that on your own you will never be able to live up to the expectations God has set for you and that you want to be saved through faith in Christ. Believe that Jesus Christ died on the cross and rose again for your sins. Interested in the next step as a believer? Click a button below. Jesus’ words “Whoever wants to become my follower, let him deny himself and take up his cross and follow me. For whoever wants to save their life will lose it, but whoever loses their life for my sake, and for the sake of the Gospel, will save it.” (v 34-35) challenge all believers to authentic discipleship and total commitment to himself through self-renunciation and acceptance of the cross of suffering, even to the sacrifice of life itself. 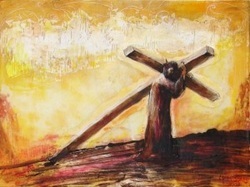 The Way of the Cross was not for Jesus alone but also for everyone who professed to follow him. There might be victory and glory ahead, but it was only for those who could take up the Cross. If Peter or anyone else should reject this demand it meant to be on the side of Satan. Life seen as mere self-centred earthly existence and lived in denial of Christ ends in destruction, but when lived in loyalty to Christ, despite earthly death, it arrives at fullness of life. When you decide to Follow Jesus with all your heart, soul, and mind it is a glorious thing. ​The next step is serving Him. Are you interested in making a public confession to follow Jesus through Believers Baptism? Would you like to speak with the Pastor about committing your life to Christ?